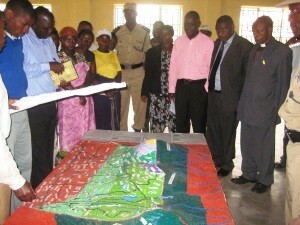 This 1:10,000 scale Participatory 3D Model (P3DM) of the Mgahinga Gorilla National Park in Uganda has been produced by Batwa Peoples with Financial assistance from Forest Peoples Programme and hosting by United Organisation for Batwa Development in Uganda (UOBDU). ERMIS Africa provided technical support for the manufacture of the model. In 2009 a group of Batwa representatives from Uganda travelled to Ogiek communities in Kenya to learn about their situation and the different advocacy strategies they were using. One of these strategies included P3DM, which helped the Ogiek engage Kenyan agencies on their rights to their ancestral territory, the Mau Forest. The Batwa walked away from this visit impressed by the simplicity of the P3DM technique and hopeful of replicating it in their own context. Two years later in June 2011, the Batwa, with support from the ARCUS Foundation, began their own three-dimensional modelling of their ancestral territory, Bwindi Impenetrable National Park. More than 100 representatives from the Batwa communities surrounding Bwindi, including youth, elders, women and men attended the exercise over a three-week period. 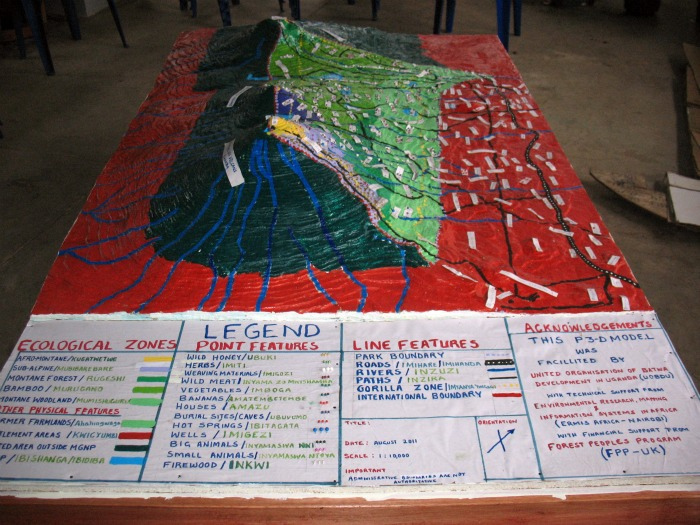 This model is the first P3DM exercise organised by the Batwa, former hunter-gatherers who were evicted from two national parks about 20 years ago.